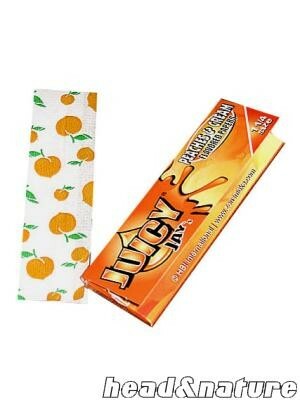 Juicy Jay's Orange 1 1/4 flavored hemp rolling papers are flavored like a fresh and juicy orange, and give your smokes a pleasant taste. Roll up some tobacco and create some of the best smokes you've ever had. These rolling papers are made of hemp. Each Packet comes sealed for freshness so the Citrus taste and aroma don't fade. If you like Orange then you have to try these great tasting papers. Each packet contains 32 papers.